Step-by-step example showing how to solve linear equations. To see an example of how the linear equation solver calculates a solution, select an equation from the drop down menu - which will enter the selection in the equation field for solving. To clear the equation field to enter your own equation, select "---ENTER MY OWN---". No spaces between terms or operators. One variable only and no radicals or exponents. Parenthesis only for distribution and no more than 2 terms within a parenthesis, and no nested parenthesis (parenthesis inside parenthesis). Numerators and denominators must be integers only (no expressions). Decimal numbers can have a maximum of 2 decimal points. Below is the result calculated by the linear equation solver for the entered equation. Please substitute the calculated result for the variable to make sure the result is in fact a solution to the equation. This calculator will use the distributive and equality properties -- as well as combining like terms and inverse operations -- to solve math linear equations having one variable. Specifically, this math equation solver will handle multiple distributions (maximum of 2 terms within each parenthesis) and simplifications involving the elimination of fractions and decimals (not radicals or exponents). Plus, unlike other online math solvers, this calculator will show its work and give a detailed step-by-step explanation as to how it arrived at the result. This makes the solver especially useful for checking the answers you derive from solving the equations manually. Select an example equation and click the "Solve Linear Equation" button to see how the equations should be entered and how the calculator solves them. Continue solving examples until you are ready to enter your own equation. Select the "---ENTER MY OWN---" option and enter your equation. Click the "Solve Linear Equation" button. This will attempt to solve the entered equation. If a solution is found the calculator will display the step-by-step process it used to arrive at the result. The expression a(b + x) is the same as ab + ax. Therefore, 5(2 + 5) simplifies to 10 + 25 (5 * 2 + 5 * 5). If the expressions on each side of an equation are equal, then adding or subtracting the same amount from both sides of the equation will not change the equation. If the expressions on each side of an equation are equal, then multiplying or dividing by the same amount (except for zero) on both sides of the equation will not change the equation. What linear equations are and how to solve them. A linear equation is an expression that can be written in the form ax+b=0, where a and b are constants and x represents an unknown variable that, once found, will make the expression true. Solving linear equations is a process aimed at getting the variable by itself on one side of an equal sign and everything else on the other side. 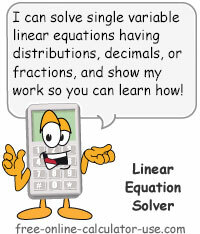 In order to explain how to solve linear equations, I will use an example equation that contains all 4 types of terms that can be handled by the linear equation solver. Regardless of which method or tool you use to solve linear equations, you should always check your results by substituting the result for the variable and seeing if the resulting equation proves to be true. After all, humans create math solvers, and humans make mistakes. The solution 9/4 is the solution to the example equation. If you have any questions regarding the explanations on this page, please submit them using the feedback form located beneath the calculator.